Jackson and Audrey made special Valentine cards for their grandparents and great grandparents this year. They had lots of fun playing with stickers and glitter and cutting and gluing to make each one special and unique. They also included a picture of themselves. Jackson's pics were on the front, and Audrey's were inside. It was a lot of fun seeing their creative minds at work! Jackson's class went on a field trip to George Ranch yesterday, and I tagged along! 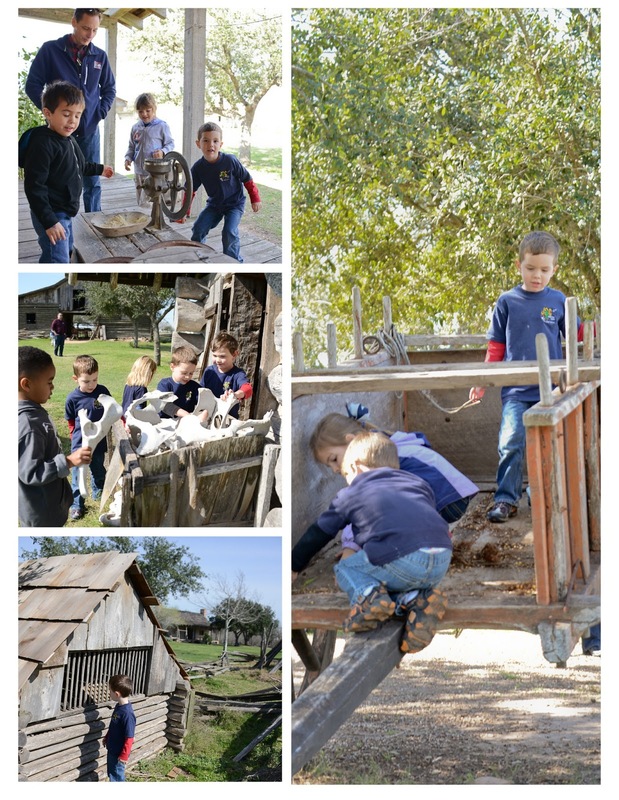 The park does a great job showing what life was like on a Texas ranch during the 1800s. 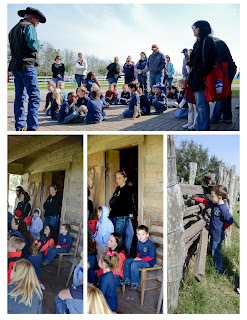 A real cowboy kicked off the day with some rules and guidelines before we made our way to an 1830s stock farm. 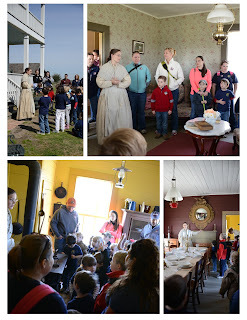 We were guided through each part of the ranch by someone dressed in a period costume. They described what life was like during that time frame in a way the kids could relate to. 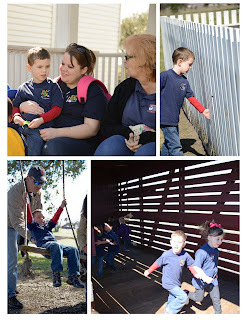 The kids got to explore and touch everything they saw at the stock farm. They got to visit some pigs and chickens, play with some bones, and make some corn meal! Next they went to an 1890s mansion and learned about a more refined lifestyle. They got to practice using their manners too! After being told a little about the house while standing outside, the kids were instructed to allow the ladies to enter the house first, which Jackson took very seriously. He made sure none of the boys entered until every girl was inside...he's gotten really good at listening and following directions in a learning type of environment. (I'm ready for those skills to transfer to home too!) Once inside they learned how to properly say hello to one another. The girls learned to curtsy, and they boys learned to bow. Then they made their way to the next building. It contained the formal dining room and kitchen, which they learned was separate to prevent the main house from burning down if there was ever a fire in the kitchen. The kids also learned they would not be allowed to sit at that table until they learned hundreds of rules. They were asked to state any they knew, and there were several fun rules that I bet may not have been on the original list! 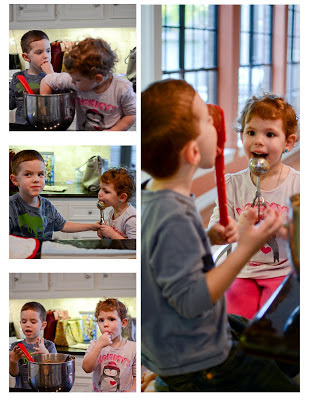 From there they explored the kitchen, which is where they would have eaten until they learned all of those rules! 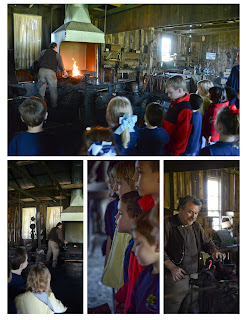 The next stop was the blacksmith's shop. 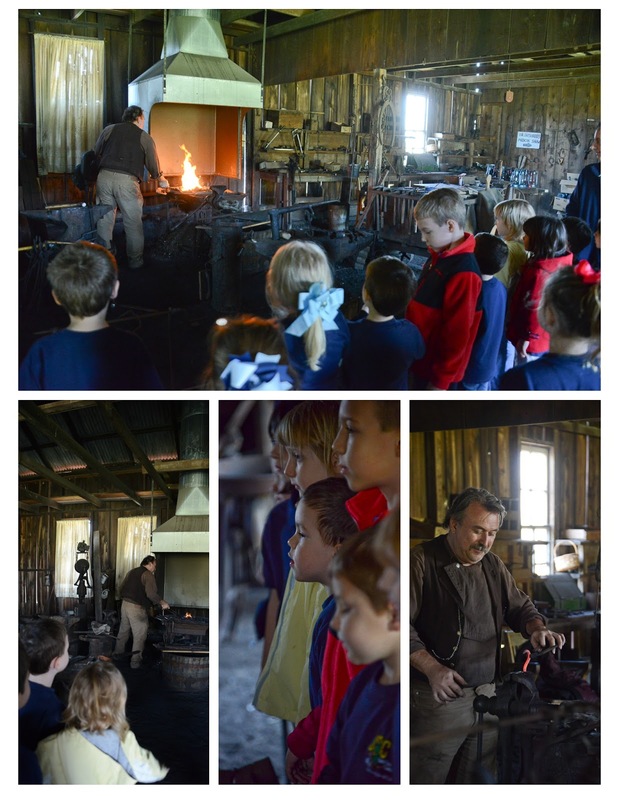 Watching the blacksmith work was one of the highlights of the day. He made an s-hook and a bracelet while we watched, in addition to telling everyone some fun and interesting facts about the job of a blacksmith. He passed around several items for everyone to checkout, but attempting to solve one of his puzzles was a favorite of the adults and kids. Lunch at the chuckwagon was next on the agenda, and Cookie was an entertaining host, as well as a good cook! We had some delicious beef stew and beans, which Jackson devoured while Cookie shared about life on a cattle drive. We learned the cook was the real disciplinarian of the bunch, as well as the doctor. The kids were ready to run around a bit at this point, so they did! They explored a train car that moved cattle, checked out the sharecropper's land and pigs, and did a little swinging. 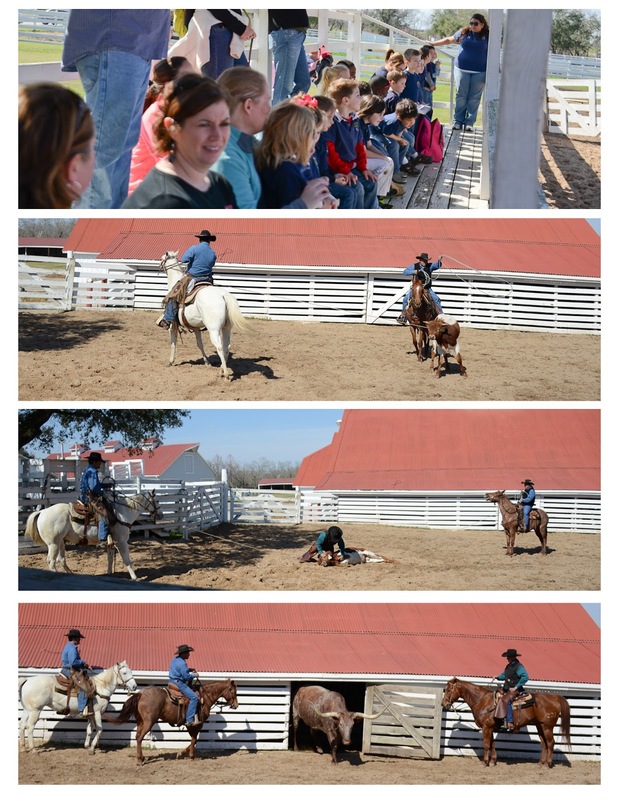 The cowboys gave us a demonstration of what it's like to work with cattle. They roped a calf and showed us how they would pin it down to brand it. 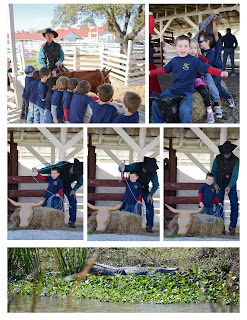 Then they showed us a little "cutting" (separating) of the calves, and finally, they introduced us to one of their longhorns. 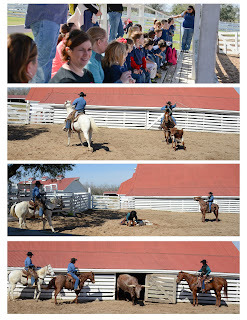 After the show was over, the cowboys let the kids pet the horses, and gave us all a chance to try our hand at roping! Jackson was one of the first ones in line, and he was also the first one to get his lasso around a horn! He was beyond excited! He was even more excited when I didn't get the rope around the cow...meaning he could do something Mommy couldn't! The alligator was something we stumbled across while walking near a creek. I was happy to show it to Jackson and move on! It was a long, but extremely fun day! I can't wait for Audrey's turn to visit in a couple of years! There are lots more pics in the album! 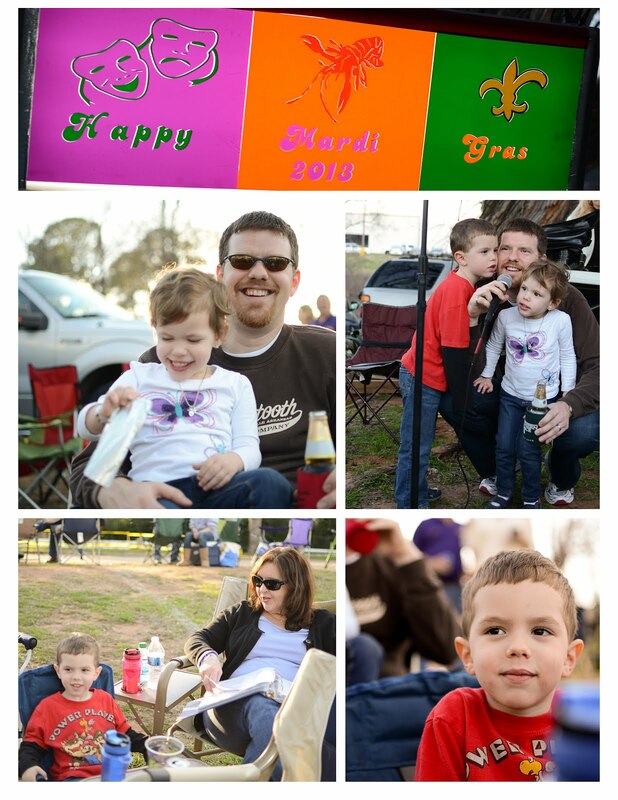 Last weekend we made our way to Shreveport for the Crew of Centaur parade. 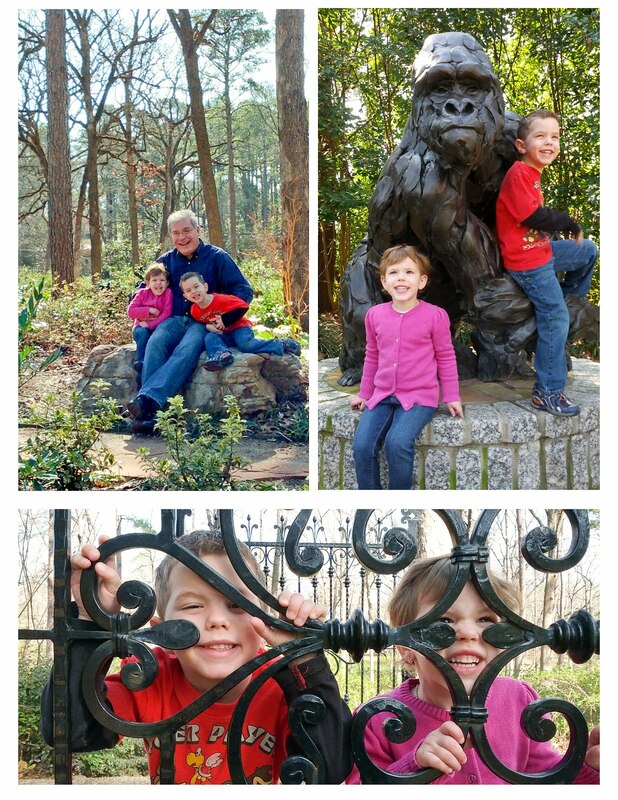 We spent a little time the morning before the parade walking around the gardens at the Norton Art Gallery with Pop. 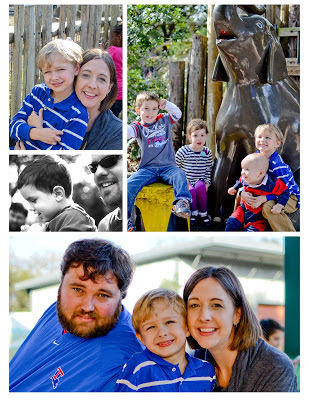 It was a gorgeous day, and I was extremely disappointed to realize I'd left the memory card for my camera in Houston. That didn't keep me from taking pictures though! 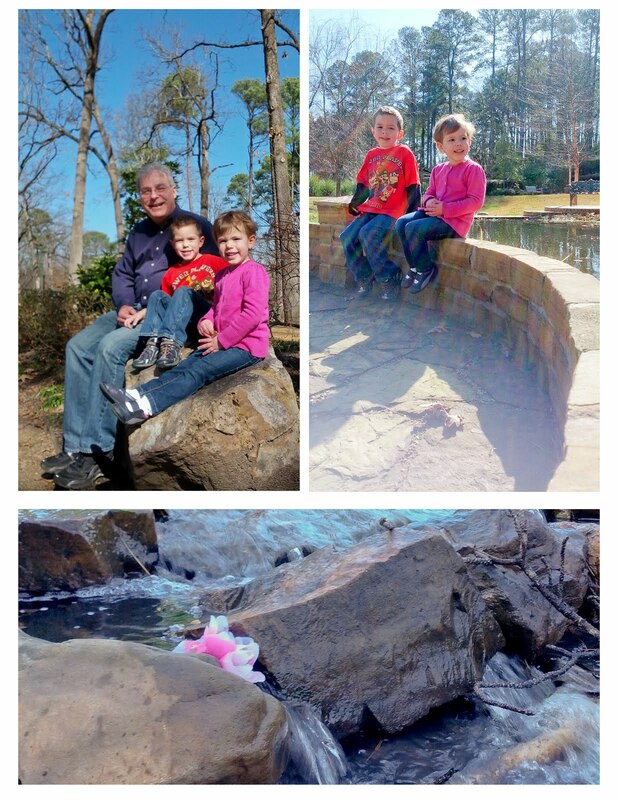 I was determined to see what my phone could do since the kids were eager to pose with Pop! 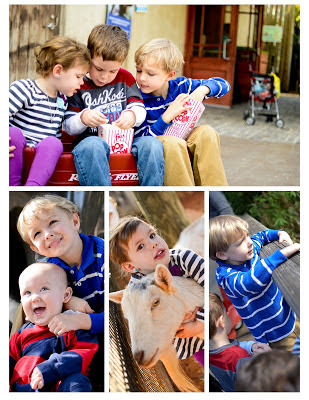 While they took some great serious shots, they loved being silly too! 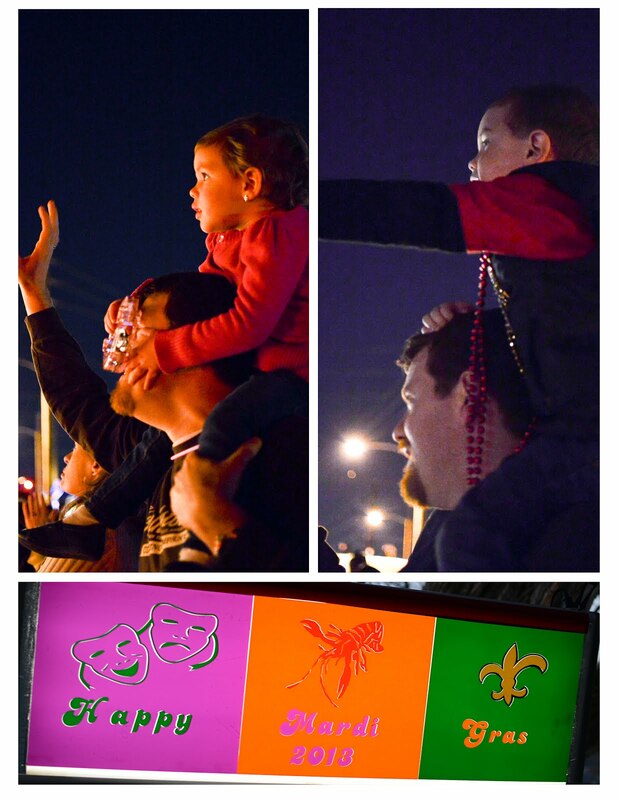 Both kids took a great nap, which we were grateful for since we knew they'd be up a little late at the parade. My mom, Susan, and our krewe arrived at Ross' Uncle Ronnie and Aunt Laura's site around 3 PM just before the streets were closed. We wandered up and down the streets for a while taking in the fun and craziness of the day. Then we settled in at our spot for some delicious food and a little karaoke! The party continued after dark with more karaoke and a nice fire to keep us warm. 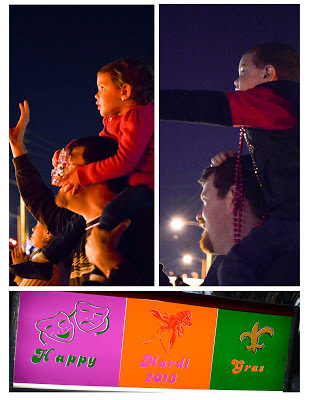 When the parade arrived, the kiddos were ready to climb up on our shoulders and catch some loot! Audrey was a little nervous at first as you can see in the picture below...I'm not sure how Ross was catching anything at that point! It didn't take her long to relax as long as the floats weren't on the scary side. Her strategy was to put every bead, cup, and toy she caught in her bag rather than wearing or holding them. Jackson was more eager to wear and hold on to what he got. I'm not sure which strategy was most effective, but I do know we came home with a LOT of beads, cups, and toys! 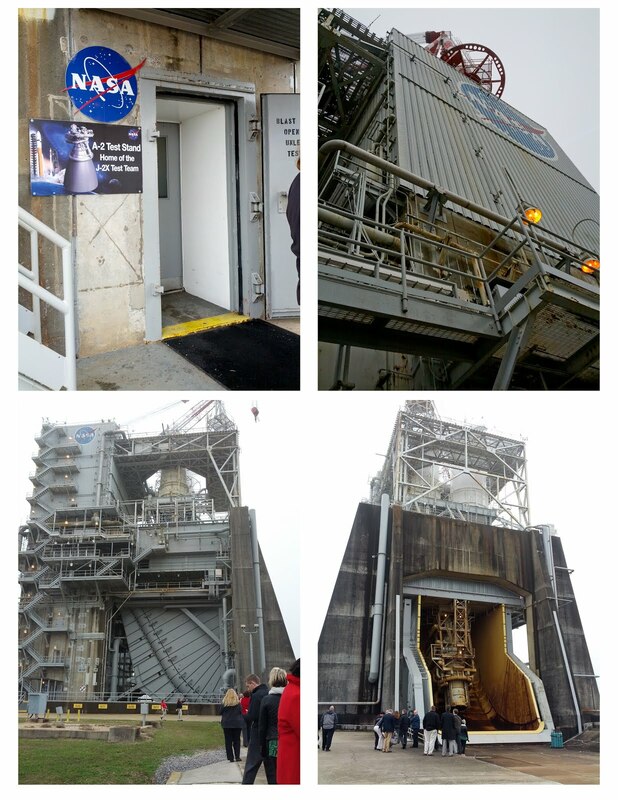 It was a very quick trip, but it was worth every moment! There are more pics in the album. And we made some chocolate chip cookies...I think these kids are a fan of cookie dough! I wonder where they get that from? It was nice to take it easy for a few days after the busy start we had to the new year! 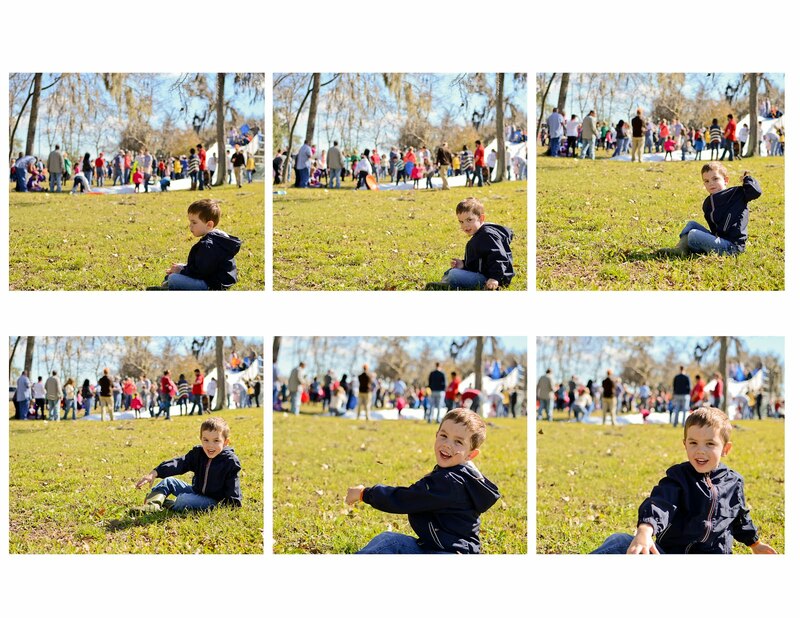 There are a few more pictures of the kids playing around in the album. The Tims family arrived for a visit the day I returned from my first MLLP training trip. We spent most of Saturday morning visiting before we headed to the neighborhood snow day! It was so much fun that it deserved it's own separate post with pics, which you can find here! The guys were amazing and let Barbara and I shop the new outlet malls without the kids for the afternoon. We had lots of fun finding deals and catching up on life! Sunday afternoon we made our way to the zoo. 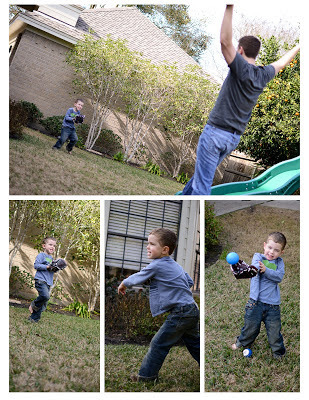 It was an incredibly gorgeous day, so everyone else in Houston had the same idea. We had a tough time finding a parking spot, so we dropped everyone off while I circled the surrounding area for over 45 minutes trying to catch a spot. I was ready to give up just when a spot became available, so the fun quickly continued from there. Since it was such an ordeal to get there, I was determined to see and enjoy every moment! We saw as many animals as we possibly could, enjoyed some popcorn and monkey tails, hugged and brushed some goats, played on the playground, and eventually wore ourselves out! The next morning Jackson was excited to play a little Mario Kart with Carter before they headed home. Poor Audrey wasn't feeling great at this point, which we discovered later in the week was because she had the flu. Unfortunately, Jackson got it later in the week as well, so we got some extra time together, which made up for the week I was gone before that! We loved getting to spend some time with one of our favorite families for the weekend though! There are more pics of the fun in the album. 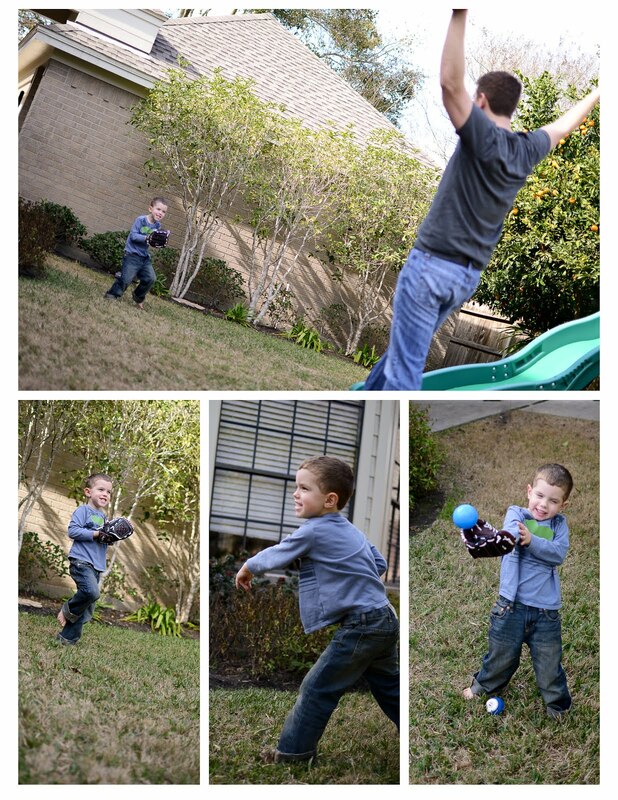 So it didn't actually snow in Houston this year, but we did have a snow day in our neighborhood! Our friends, The Tims, happened to be down for a visit, so they joined in the fun! The community association brought in the snow for a social event. 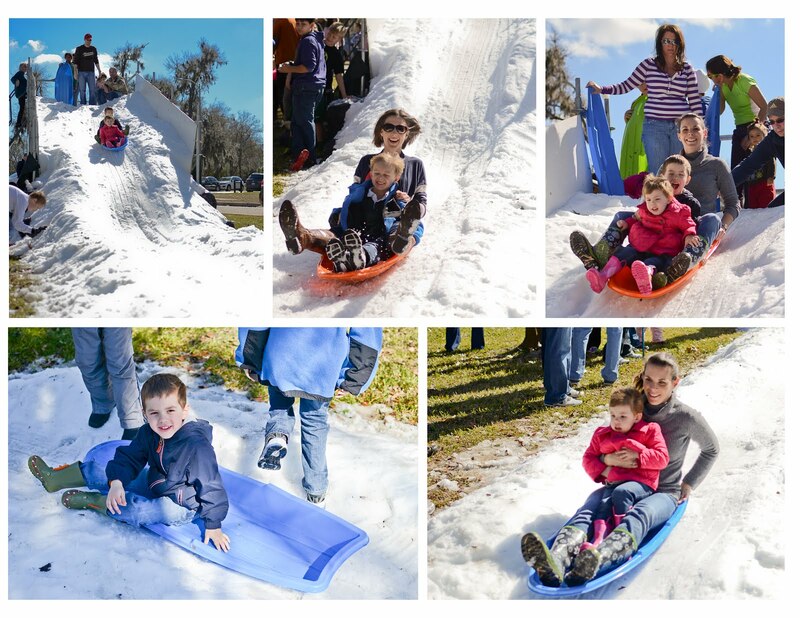 A "hill" was built since we don't have any in this area, and the kids and adults had a blast sledding down! There was also a square of snow set up for very small snowman building, snow angel making, and of course, snowball throwing! 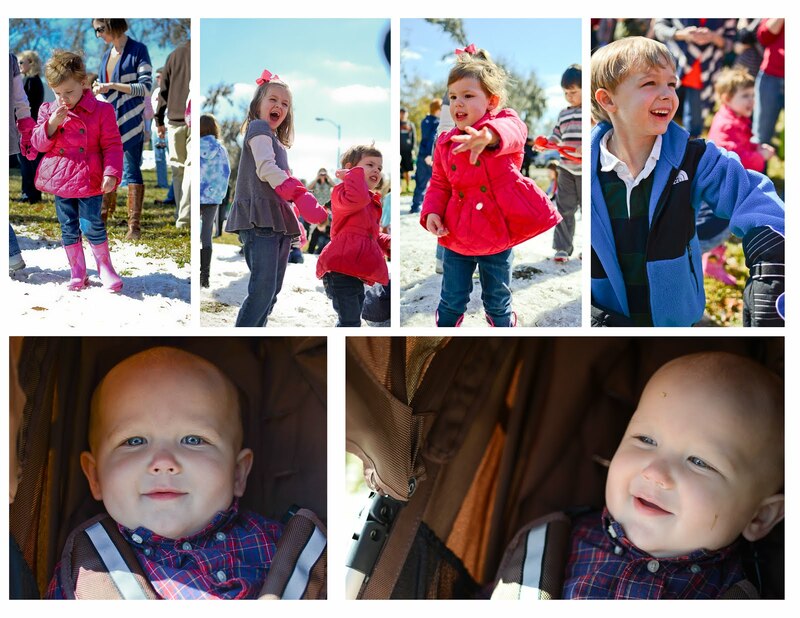 All the kids loved it, and Audrey couldn't resist tasting a little snow. Even baby Graham enjoyed the experience from the warmth and safety of his stroller! Jackson was having a tough time listening and following directions at one point, so he had to take a break/time-out. 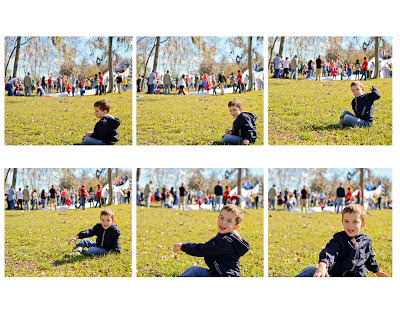 I, of course, documented the experience with pictures, which, to my surprise, helped Jackson get out of his funky mood. I love that you can see the devious thought process on his face...he's throwing leaves at me. I was happy to see the smile back on his face, and the rest of the day was tons of fun!